Drenched in paperwork? Feel like you’re writing down the same information a million times? Not anymore! Smart Service works as a direct add-on to QuickBooks to integrate your administrative systems. Smart Service irrigation software was developed for businesses like yours. It uses the customer and equipment information you have in QuickBooks to create work orders and optimized schedules to keep your business growing (and keep the grass growing too). Scheduling irrigation jobs is easier than ever with QuickBooks integration. 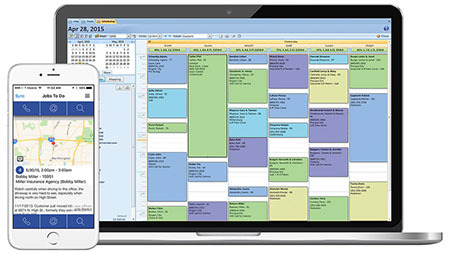 Simply click where on the schedule you want the job to be and then fill out work order information. Type in a customer name, address, or another detail, and Smart Service will automatically populate the work order with the rest of the data you need. Voila! Your schedule and work order are complete. Sure, powering your office with Smart Service is great, but when your irrigation business works on-the-go, you need on-the-go software to support you. The Smart Service mobile app functions as an extension of the office onto your employees’ mobile devices or tablets. They are able to view their schedule, work orders, previous job notes and pictures, and more! If a new job comes up, just add it into the schedule from the office. Your assigned technician gets the alert and can accept or decline the job, so there’s no need to call back and forth between the customer and technician! Smart Service integration with QuickBooks allows for an easy transfer of customer and equipment data between systems. Got a new customer? Put information into Smart Service and it shows up in QuickBooks right away. No more double data entry! When you are creating a work order, you can use the equipment put on that work order to generate a ready-to-bill irrigation invoice immediately with equipment cost and information. QuickBooks integration sure makes life and running an irrigation business easier, doesn’t it? Irrigation software for QuickBooks is more than meets the eye. See for yourself and request a demo of Smart Service now! Want more irrigation business tips?